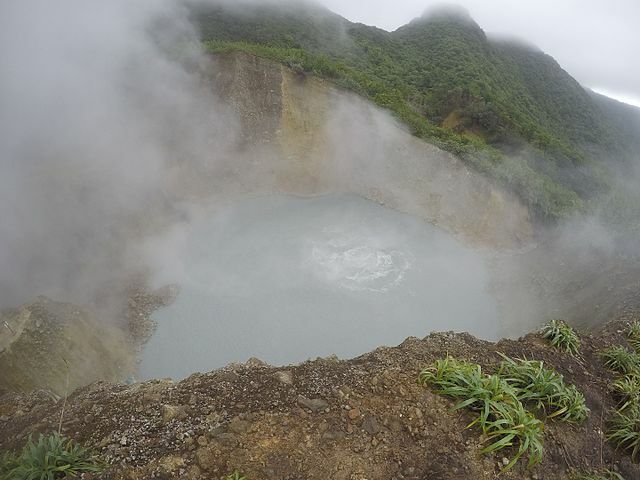 Boiling Lake is located in the Morne Trois Pitons National Park in the island country of Dominica, West Indies. It is the second largest hot lake in the world after the Frying Pan Lake in Waimangu Valley near Rotorua, New Zealand as it measures approximately 200 feet to 250 feet across. It was discovered in 1870 by two Englishmen Edmund Watt and Henry Alfred Alford Nicholls. It is actually a flooded fumarole filled with bubbling water which is greyish-blue in color and mostly remains immersed with a cloud of vapor. The color of Boiling Lake’s water varies. Usually it ranges from greyish-blue to bright blue but sometimes becomes green as well. The water temperature along the edges ranges from 180 to 197 degrees Fahrenheit. The temperature at the center cannot be measured. The water gets heated by hot steam and gases that escapes from the molten lava below. The trail to reach the lake is around eight miles long and it is a three-hour walk each way. The level of the lake gets affected by mild phreatic eruptions in the region that occur periodically. When the regular inflow in interrupted by nearby volcanic activity, the surrounding rocks allow water to escape. The lake is fed by a waterfall and two small river streams that drain into this area.